Albino animals have a genetic mutation that causes an absence of tyrosinase in their pigment cells, which means they don't produce melanin pigments. While true albinos are thought to be rare in the wild, a number of animals have a similar genetic abnormality called leucism that also manifests in white fur, feathers, scales, or skin. This albino animals photo gallery includes several leucistic animals. How do you tell them apart? It's all in the color of the eye. As you may know, true albinos have red or pink eyes, but leucistic animals may have black, brown, or even blue eyes. However these animals are classified, they're all super cool to look at. After all, what's a giraffe without its spots? How about a cardinal that isn't the traditional bright red? But while we may often see albino mice or albino rabbits, it's not often that we catch glimpses of many other albino animals. This is, in part, because bright white animals are very vulnerable to predators. A zebra's black stripes aren't just for show - they're protective camouflage that conceal it from lions, leopards, hyenas, etc. The life expectancy of an albino baby animal born in the wild is very short. For more pics of cool animals, check out these lists of marine invertebrates photos, the most beautiful animals, and the animals with the cutest babies. Local fishermen call this rare pink dolphin "Pinky" -- she has been spotted several times in Calcasieu Lake, Louisiana, most recently in 2015. Albino dolphins are very rare and unfortunately, their pretty pink color makes them extremely vulnerable to predators. #2 on What Sea Creature Do You Want to Be? This rare orangutan was rescued from an Indonesian village in May 2017. 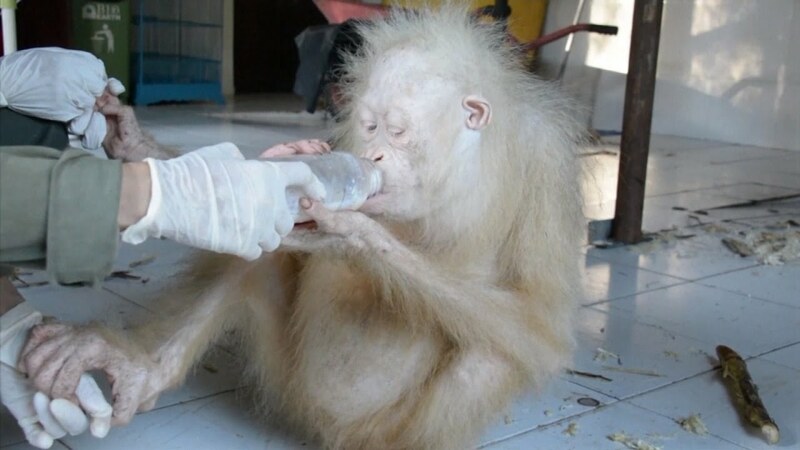 The five-year-old animal was kept in a cage in Borneo, but when the Borneo Orangutan Survival Foundation discovered his existence, they fought to free him. They named the orangutan "Alba" which means "white" in Latin.